On Today’s episode we discuss Genesis 2 broadly and the covenant God made with Adam. We consider objections to and reasons for saying that Adam was in a covenant. We discuss the nature of this covenant. We also consider how the “first Adam” relates to Jesus Christ, the “second” and “last Adam.” Finally, we discuss how Adam’s role as a covenant head relates to the gospel and the implications for denying this role for Adam. We invite your comments and feedback! On Today’s episode we discuss the garden of Eden and the description given to it in Genesis 2:8–15. We discuss how the garden motif found in Genesis 2 permeates the rest of Scripture. Also, we consider how the garden imagery is used within Scripture to describe God’s dwelling place among His people. We discuss similarities and polemical differences between the garden elements in Scripture and in Ancient Near Eastern writings. Finally we discuss Adam’s place in the garden and his priestly duty to “guard and keep” God’s garden. In this episode of Proclaiming Christ we address the issue of whether there are two different creation accounts: one in chapter 1 and another in chapter 2. We discuss the covenant name of God which is introduced in chapter 2. We also reflect on the repeated use of the phrase “these are the generations of” which first appears in chapter 2 and provides a way of dividing the rest of the book. We also consider the description of the creation of man in chapter 2. In this episode of Proclaiming Christ we discuss the creation mandate given to Adam and the promise of Sabbath rest. We invite your comments and questions. In this episode of Proclaiming Christ we discuss days 4–6 of the creation account in Genesis 1. We continue the discussion of light and darkness in creation as it pertains to the fourth day, the kingdom of God in creation, and the creation of humanity in the image of God. In this episode we discuss verses 3–13 of Genesis 1: the first three creation days. We discuss the covenantal character of creation, the theological dimensions of these days, God’s dominion and interpretive prerogative in naming and ordering the days. We also look at the significance of those things which are the focus of each day: light, the separation of the waters above and below, the separation of the seas and try land, the creation of vegetation, and many other things. We welcome your questions and feedback in the comments. In this episode we discuss the first two verses of Genesis 1. The episode focuses on the centrality of God in creation. We begin by discussing some interpretive assumptions involved in reading this passage. We also consider: the distinctiveness of the God of the Bible over against the pagan myths, God’s sovereignty and freedom in creation, creation ex nihilo, the creation of the invisible heavens and the visible earth, the initial formlessness of creation, and the work of God’s Spirit, and many other things. Proclaiming Christ considers an introduction to the book of Genesis, looking at creation as it points to the eschatological glory of God. 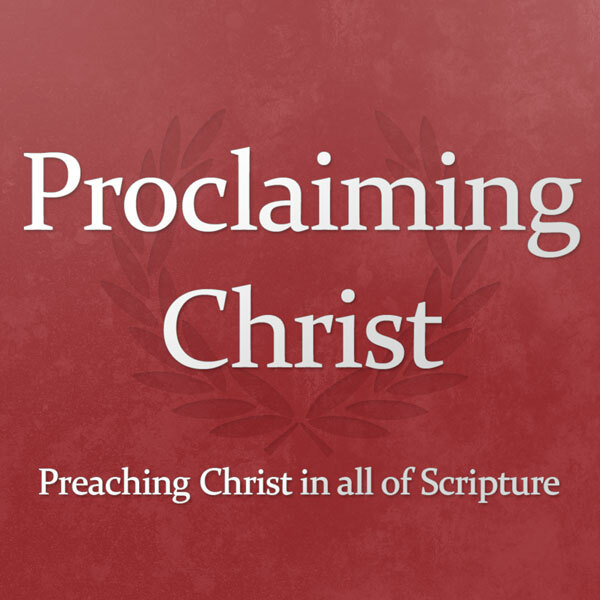 In this episode of Proclaiming Christ the panel considers sermon delivery. We discuss things like: whether to use a manuscript or not, sermon application, resources, and things not to do while preaching. Please join us by listening along. We invite you to share your thoughts, questions, and comments. In this week’s episode we discuss sermon preparation. As the panel considers the kind of work that must go on before a preacher is ready to preach, we discuss things like: the importance of prayer; the reading, re-reading and meditation on Scripture, the importance of the original languages. We also briefly discuss whether all preaching should be consecutive expository (lectio continua) or whether there is a place for timely, topical-textual sermons. Please join us by listening along and we invite you to share your thoughts, questions, and comments.